Well, just the shells really. OK just small scallop shells. Below is a detail of the tray with two medium receptacles. 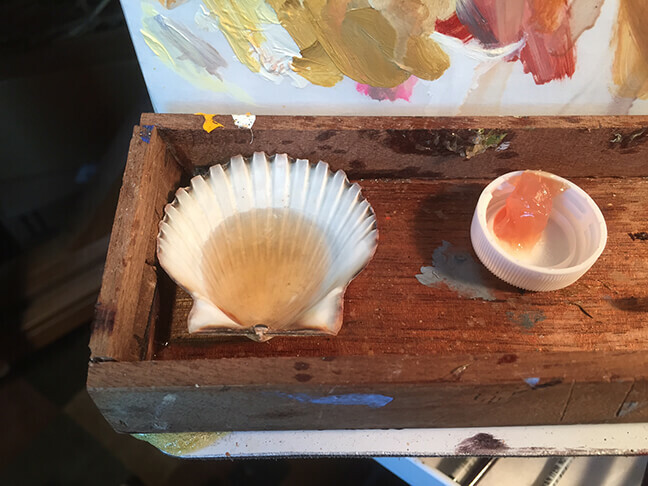 Since I use such small amounts of liquin, fine detail and impasto, and since they dry out very quickly, I have found that the disposable cap lid is great for the heavier blob, and the refined scallop shell works great for the thinner stuff. Most nights I remember to wipe out the shell and it is ready for the next morning’s dollop. 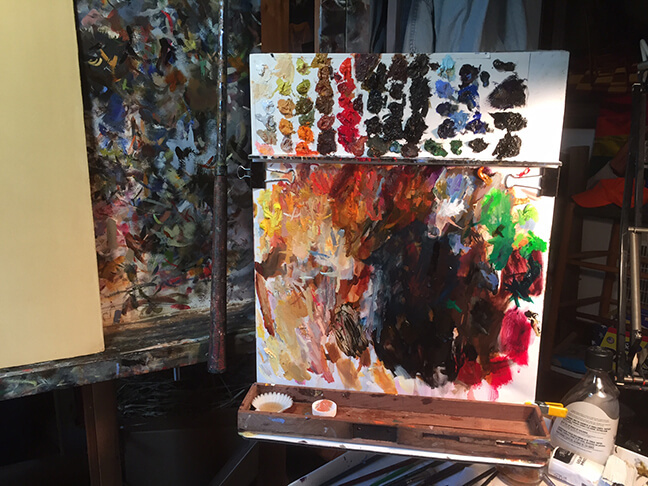 But a lot of nights I forget and so it is a sticky mess the next day. After a few months of this the shell has built up a thick coating and today it was no longer able to function up. I searched around and have a couple more shells, doesn’t the nice new clean one look spiffy here ? But I know it will not last the winter, I could probably use one a month…so…I’m throwing down a request to my island pals. When next you take a walk on the beach, or along the shoals, or out behind Larsen’s,would you please pick up a few shells for me. I used to find the best stash at that turnout on the right at the entrance to Sengy pond, just after Harthaven. The maximum width is 2 1/8″ to fit in my trough. I suppose a clam shell would work as well. It’s such a blessing to have island friends when you live in a landlocked state.